Time Out New York magazine listed our popular tour of Victorian Flatbush, in Brooklyn, as one of “10 fascinating architecture tours in NYC”. We were honored to be included there, and hope you will join us sometime to see why it was spotlighted as a unique NYC experience. Flatbush itself is one of the original six towns of the formerly-independent city of Brooklyn, dating back to the Dutch colonial era. Remnants of this heritage are seen on the tour, including one of the city’s oldest cemeteries. After Prospect Park was built in the 1860s (back when much of Flatbush was still farmland), developers took notice of the potential for new neighborhoods in Flatbush. Just south of the park, starting the 1880s, several developers worked to build a wealthy suburb that would be different from the brownstone & row-house trend of the rest of Brooklyn. Instead, they aimed to build a more suburban neighborhood, filled with huge homes and mansions, private sporting clubs, all within walking distance of this new park (and a short train ride away from the beaches of southern Brooklyn). Thus was born “Victorian Flatbush”. Half of these developments across the area were destroyed in the 1930s to make way for middle-class apartment complexes, but several historic districts preserve its more picturesque and historic parts. Recently, the Brooklyn real estate blog Brownstoner published some unique, birds-eye view photos of the area as it had grown, circa 1907. These are great shots, and experts on this neighborhood’s history will spot some unique finds in the photo, which I’ll spotlight here. In this large, panorama shot, on the upper right, I’ve circled a pedestrian bridge across the railroad tracks (today the tracks are used by the NYC subway). This bridge was placed along the most scenic road— Albemarle— to connect one end of the Victorian neighborhood to the other. Today, the rail tracks largely (with a few exceptions) mark the dividing line between the preserved section of the neighborhood and the post-1930s section. The bridge was demolished about 40 years ago, to meet the angry demands of the wealthy mansion-dwellers to better separate themselves from the working-class populations starting one block over. You can read the fascinating history of this rail line, and the forgotten bridge here. 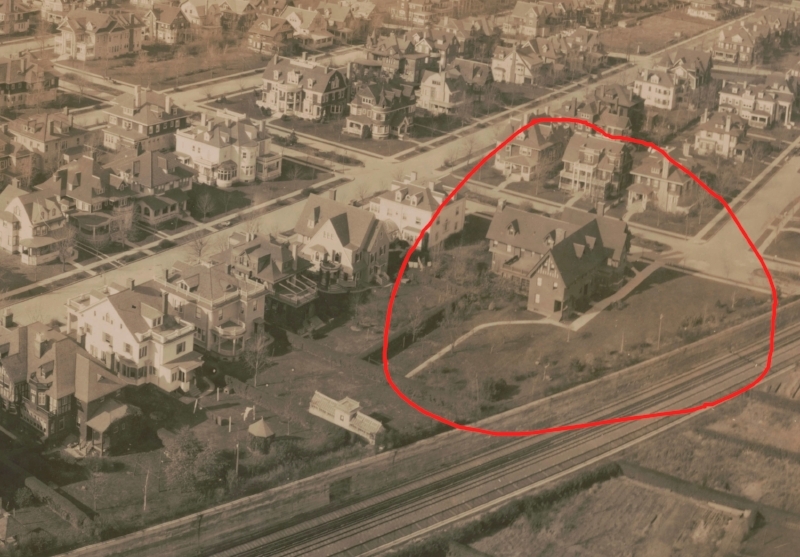 Circled by me there is a mansion that no longer exists. It was built by developer Dean Alvord as his personal new home. He had decreed that, after his death, the home be razed and the land donated to the community for common use. Today, the lot is the home of the Flatbush CommUNITY Garden. If you look at the site today, the driveway and the foundation of the home are still intact, but otherwise it remains a (now membership-only) community garden. Want to see all of these sites, and the larger neighborhood, as they look today? Take a look at the slideshow of images on our listing page for our Victorian Flatbush tour, and see our calendar of public tour dates. We can also do this as a private tour on many other dates. Come see gorgeous suburban blocks, Victorian-style mansions, and history in central Brooklyn!